Automotive enthusiasts the world over get much of their modification inspiration from parts and pieces that are used in the cutting-edge race programs of today’s motorsport programs. One area where this inspiration is especially evident shows in the choice of wheels used by the devotee, whose designs often mimic those found on the racetrack. Up until current-day, melding the motorsport wheel design and construction with road-going capabilities hasn’t been a focus, but BBS USA is out to change that perception with their newest product line, the RT wheel series. “The BBS Road Track (RT) wheel was created to bridge the gap between true racing components and the needs of enthusiasts desiring these components for their street cars,” says Eric Niconovich of BBS USA. Using a wheel on the racetrack dictates specific design criteria, which are very different from the benchmarks used to develop a road wheel. With BBS vast database of wheel fitments, a motorsport program with access to the world’s top race teams, and immense manufacturing capabilities, the BBS team saw an opportunity to merge their racing styles with the capabilities offered by their road wheel designs. 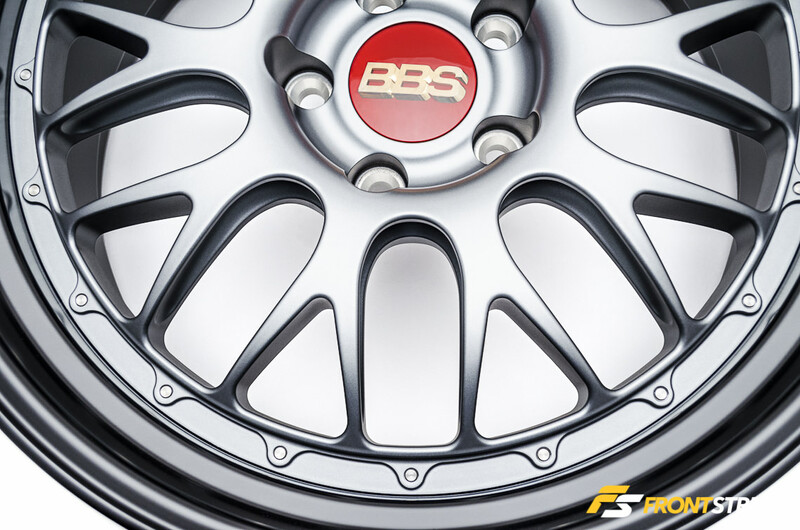 In order to create the new wheel, BBS took the wheel center configuration from their Motorsport program and tailored it to work with the existing forged one-piece barrel of the BBS LM platform to create a true custom wheel. By using these two pieces combined together, BBS can offer the appearance of the true race wheel, without any of the concerns or drawbacks that can be correlated with using a race wheel on the street. The forged construction of the RT-series wheel barrel lends itself well to absorbing the abuse potholes and other road hazards can impart, while retaining the race-inspired styling of the multi-piece construction seen in the race wheels. “The new RT barrels will be finished with a polished outer lip in the same manner of the motorsport outer rim halves, though they will be clear-coated for protection just like the diamond-cut barrels of the LM program. Titanium hardware modified from the RSGT wheel program completes the look while thwarting any corrosion concerns,” says Niconovich. Since the set of wheels seen here are the very first set released to the public, BBS is still hard at work creating part numbers and barrels for each of the fitments to be offered. Currently the plan is to offer 19-inch applications for all popular BMW and Porsche fitments, with 20-inch and certain select 18-inch applications to follow. The 19-inch applications permit easy clearance for big brake kits on all BMW M-cars since these vehicles require the tall flange height wheel center for clearance purposes. Non-M cars use wheels with a lower flange height, but brake clearance is also ample for many brake systems. “Standard colors for the centers are the same as BBS Motorsport offers for their racing products – Silver, Gold, Gloss Black, Satin Black or Titanium; these centers will be stocked here for assembly into LM barrels,” says Niconovich. Currently, the only wheel offered in this program is the RT88, based on the BBS Motorsport program’s E88 style, although BBS says virtually any of the company’s Motorsport wheel styles can and will be adapted to the RT wheel program over time as development continues. Initial retail in 19-inch standard finishes will be $1,495.00 per wheel; prices will vary depending upon finish chosen and wheel size.